Viburnums are a large group of flowering shrubs. Desirable for their spring flowers, colorful foliage and autumn berries, viburnums are also hardy plants and will grow in a wide variety of climates. The viburnum family encompasses around 150 species, each with many cultivars. All will grow in shade, according to Ohio State University, although colors and blooms may be reduced. For that reason, it is difficult to pick just one best viburnum. Some, however, do stand out above the rest. Most viburnums have one time of the year where they stand out. They may have brilliant spring blooms or colorful fall foliage. Or, maybe their berries are exceptionally showy. Viburnum wrightii, on the other hand, is an outstanding shrub in all seasons. While it is only hardy to U.S. Department of Agriculture growing zone 5, it more than makes up for its lack of cold tolerance with its beautiful spring blooms, wide, glossy green summer foliage, and very bright red fall berries. The Wright viburnum will grow in shady locations and is one of the smaller species, growing to a maximum height of only 10 feet. The maple-leaf viburnum (Vibunum acerfolium) is the top choice if you have a very shady location. This shrub thrives in the mountains of the northeastern United States and is distinctive for its leaves, which look like those of a maple tree. Unlike many viburnums, this one grows slowly, and will reach a maximum height of only around 6 feet. The fall color on this plant is outstanding, with leaves ranging from bright pink to a deep purple. Spring flowers are white, and late summer berries are black. Viburnum dentatum, or the arrowwood viburnum, is singled out by Iowa State University as being an outstanding native shrub for shady locations. 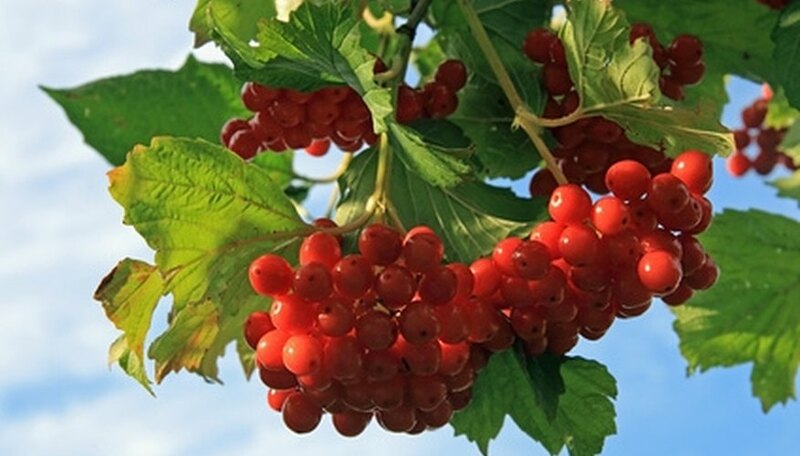 This highly adaptable viburnum will adjust to most types of soils, and the production of the plant's white spring flowers and blue autumn berries are not affected by a shady location. This viburnum can grow up to 15 feet tall, so give it plenty of room in your landscape. Many viburnums that tolerate shade will not bloom as profusely, but the leatherleaf viburnum (Viburnum rhytidophyllum) is known for its showy display of fragrant flowers. This viburnum will not only grow well in shady conditions, but it will reward the home gardener with up to 8-inch-wide clusters of pale yellow flowers. In addition, unlike many viburnums, the blooms on V. rhytidophyllum have a pleasant scent. The shrub blooms in May. Leatherleaf viburnums also have showy fruit displays in autumn, with drooping clusters of red and black berries. This viburnum grows to 15 feet or taller.